I've done my fair share of hunting for apartments, and I have a few recommendations for any of those looking to settle down in a dream apartment complex. The people you know first hand can tell you more about an apartment complex that any website or Google review could tell you. Even if they have heresy knowledge about an apartment complex, it's always good to pay attention, especially if they have had avoidable problems with the place. No not your roommates, althoguh I'm hoping you're already planning on doing that. Make sure your neighbors are somewhat similar to your demographic. The best example is if you're a college student, you wouldn't want to live in a family dominated complex or retirement home. If that could somehow happen. Although apartment management is not supposed to release that kind of information, you can get a sense just by hanging out in the area for a little bit. You'll see most apartment complexes have pet rules. Some don't allow anything, especially if they're in a city, while others allow almost anything. If the place you're looking at allows pets, they most likely require you to somehow register them and pay a fee or monthly rate or both. If you choose to sneak around those rules, there's a good chance you can get caught, get a hefty fine, or even get kicked out of the complex if there's a wait list. I've seen it happen! (thankfully not to me). 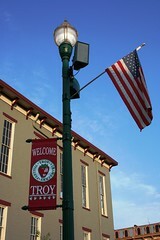 Although I've never lived in Ohio, I have heard that the First Troy Corp. Rentals group in Troy Ohio is known to be the best in that area. They have many apartment styles available including rental ranch style, townhomes, duplexes, triplexes and fourplexes.